When completed in 1899, the Old Post Office Building was criticized as looking like "a cross between a cathedral and a cotton mill" by the New York Times. The criticism sparked a seven-decade struggle to save the building. Rededicated in 1983, the Old Post Office is an example of the remarkable transformation old buildings can undergo and the rich possibilities they can offer. In honor of our nation's bicentennial in 1976, the private Ditchley Foundation of Great Britain presented a set of English change ringing bells to Congress. In April 1983, the bells found a permanent home in the Old Post Office clock tower. They were dedicated as an everlasting symbol of friendship between the two nations. The 10 Congress Bells range from 581 to 2,953 pounds and are replicas of the bells in London's Westminster Abbey. They were made at Whitechapel Foundry which had cast the Abbey's bells four centuries earlier. The bells are in the key of D major. The practice of change ringing combines the disciplines of art and science to produce a unique form of music. Change ringing involves continuously changing the order in which the bells strike. The method of producing these changes is precise and requires extensive training, practice and concentration. A full peal, which is a continuous performance that takes up to three and a half hours to complete, is rung in honor of the opening and closing of Congress and on state occasions, including all national holidays. To achieve this feat, the tower hosts a weekly practice session for the bells' stewards, members of the Washington Ringing Society of the North American Guild of Change Ringers. As chairperson of the National Endowment for the Arts (1969-77), the late Nancy Hanks led a diverse group of citizens, organizations and government agencies in preserving the Old Post Office Building. "Old buildings are like old friends...they assure us in times of change," Miss Hanks told a Senate subcommittee while testifying on behalf of saving the building. She saw the Old Post Office as an opportunity to promote the ideals of the National Endowment and "to encourage people to dream about their cities, to consider the alternatives before they tear them down." Congress honored her by naming the Old Post Office and its adjacent plazas the "Nancy Hanks Center." At its completion, the Old Post Office stood out as a symbol of prestige for the U.S. Postal Service which boasted of the building's technological innovations. It was the largest government building in the District of Columbia at the turn of the century and the first with a clock tower. It was one of the city's first steel frame buildings with a granite skin covering the steel to fireproof it. The electric power plant, capable of driving 3,900 lights, was the first to be installed in a district building. The edifice is a fine example of Richardsonian Romanesque architecture, and the tower remains a prominent point above the district's uniform skyline. The interior courtyard encompasses one of Washington's largest uniterrupted spaces (99 feet wide by 184 feet long by 160 feet high). Despite all these features, the word "old" was attached to the building only 15 years after it was completed, and someone's description of the clock tower as an "old tooth" became the rallying cry to tear it down. Critics mocked the massive arches and turrets. Tastes in building styles changed, especially in the triangle formed by Pennsylvania Avenue, Constitution Avenue and 15th Street, where city planners wanted to incorporate a classical architectural style to introduce order and grandeur. This resulted in the construction of the Federal Triangle after World War I and made way for the extraction of the "old tooth" when the Postal Service moved out in 1934. At first, lack of money in the federal budget, due to the Depression, saved the Old Post Office. Several agencies occupied the building for the next 44 years, but time took its toll. The deterioration was dramatized in 1956 when a 1,200-pound clock weight crashed through two floors. When the building was slated for demolition, many concerned citizens asked why. 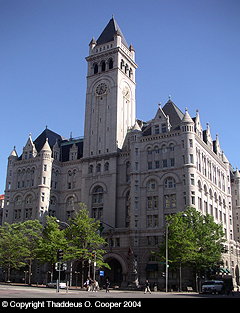 Thanks to the diligence of the Washington preservationist group "Don't Tear It Down" and the National Endowment for the Arts, headed by Nancy Hanks, the Old Post Office, along with its public use areas, federal office space and National Parks Service tour, stands today as a fine example of adaptive use. The Old Post Office is a fixture on America's "Main Street," a symbol that the nation's older structures can be saved and given a new life. Congressional committee selects site and drafts bill for purchase in same day. Willoughby J. Edbrooke, supervising architect of the Treasury, is appointed to finalize design of new Post Office Building. Construction is completed. Building used as headquarters for U.S. Postal Service and District of Columbia mail depot. Postal Service employees begin tradition of Flag Day here on June 14. District post office moves from building to Union Station. Postmaster General moves to new headquarters, and building is used for government overflow and storage. Report to President John Kennedy describes Pennsylvania Avenue as "blighted area." Presidential advisory board formed to study the future of the "Avenue of Presidents." Advisory body recommends demolition of Old Post Office and retention of tower only. Permit for building demolition approved. Preservationist group "Don't Tear It Down" plays key role in halting the wrecking. Nancy Hanks testifies on behalf of building's restoration. Congress passes Cooperative Use Act which enables private ventures to operate within federal buildings. Congress Bells ring and 13-cent postcard is issued in honor of building dedication. Building opens as home for National Endowment for the Arts and National Endowment for Humanities. Public use area dedicated. Old Post Office observation tower opens to public. The Old Post Office Tower is administered by the National Park Service, U.S. Department of Interior, in cooperation with General Services Administration. For more information, contact the NPS site manager at 900 Ohio Drive, SW, Washington, D.C. 20242, or call (202) 606-8691.